Director Aislinn Clarke explains how her found footage horror film tackles one of the darkest period's in Ireland's history. “The Devil’s Doorway” is earning a lot of buzz in the horror world for good reason. The film’s director, Aislinn Clarke, is the first women to helm a horror film in her native Northern Ireland. But apart from making history, Clarke also chose to mine one of Ireland’s darkest chapters for her debut: the Magdalene Laundries, where young women were sentenced to life sentences of hard labor for “loose morals” for nearly 250 years. “The Devil’s Doorway” is a found-footage horror film that follows two priests, Father Thomas (Lalor Roddy) and Father John (Ciaran Flynn) who are sent to a Magdalene Laundry, a Catholic home for “troubled” young women, in Ireland to investigate the validity of a miraculous event — a Madonna statue that has begun weeping tears of blood. But once there, the priests discover a sinister evil has infected the home, dredging up dark secrets from the past that the nuns have tried desperately to cover up. The film’s time period allowed Clarke to bring an update to the found-footage horror genre, which normally has a low-budget aesthetic to it. 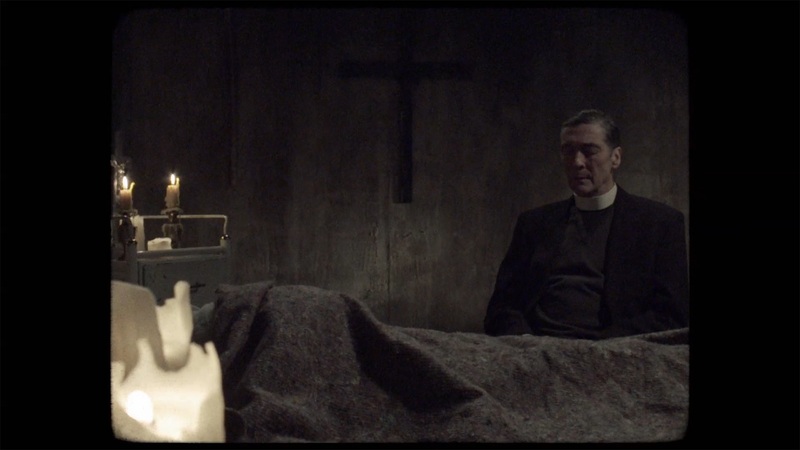 Instead, “The Devil’s Doorway” was filmed on 16mm film to mimic the type of handheld camera that Father John would have used to document the circumstances. As the entire film is captured this way, it alters the aspect ratio, giving “The Devil’s Doorway” an old home movie quality that lends it a sense of authenticity lacking in many found footage films. Clarke chose the 1960’s as the setting for the film because it was during this period when these institutions were at the height of their powers in Ireland. But in an interview with IndieWire, Clarke was clear that the Magdalene Laundries had cast a very long shadow over Ireland, one that spanned until the mid-1990’s, and the effects of these places are still being felt today. Ireland’s history with Magdalene Laundries stretches back to 1765, when the first Church of Ireland run institution was opened in Dublin. The homes were essentially asylums, where innocent young women were sent by their families, doctors, priests, or even teachers, as a way to correct “loose morals.” The homes borrowed their name and inspiration from Mary Magdalene, the Biblical character who reformed after a life of prostitution. The “loose morals” of the girls sent there could mean anything from perceived promiscuity to prostitution. Young girls impregnated out of wedlock were sent to the homes, but also orphans and mentally disabled women. The Laundries were supported by the state in Ireland, which was interwoven with the Irish Catholic Church. As Clarke explained, Laundries could be found all over the world in Catholic countries, including the U.S. and Canada, but they were especially powerful and sinister in Ireland due to the theocratic government. For young girls sent to the homes, there was no one to turn to for help. The Laundries served as work homes, places where the girls would wash sheets, which also served a potent symbolic stand-in for their own penitent “washing” of perceived sins. The girls were often worked to the bone, struggling through longer hours than most factory workers had to bear. But despite the Laundries being for-profit institutions, the girls washed sheets for hospitals and hotels, and some more recent laundries even served as assembly lines for Hasbro games such as Mouse Trap. They were never paid for their labor. The history and purpose of the Magdalene Laundries is inevitably interwoven with Ireland’s historic abortion referendum, in which 64% of the country voted to repeal the Constitutional amendment that made abortion illegal on May 25, 2018. That date happened to coincide with the world premiere of “The Devil’s Doorway,” which took place at the Seattle International Film Festival. For Clarke, the experience was a surreal one, especially as she wasn’t sure what the outcome of the vote would be. As Ireland grapples with the potential for progressive motions like the abortion referendum, it is also tasked with facing the past. Unmarked graves are still being uncovered at former Magdalene Laundry sites, including the mass grave of up to 800 children discovered in 2017 in an underground chamber at a Tuam home in Galway, Ireland. This grim discovery served as one of the inspirations for Clarke’s film, but also made tackling the subject as tricky one, as the country is still sensitive about the subject. But despite Ireland’s religious culture, Clarke was never worried about upsetting the Catholic Church. Thanks in part to Clarke’s careful tackling of the subject — the film never mocks the Catholic faith, nor does it present the girls as anything more than victims of a brutal system — the film’s premiere in Ireland was a success, and reception overall has been positive for the film. “The Devil’s Doorway” is now available on VOD from IFC Midnight.